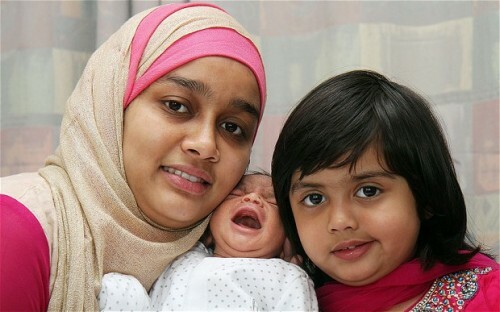 When Hamima Juma gave birth to her oldest daughter, Maheera, on Christmas day, 2009, she knew she’d received a Christmas miracle. But when she welcomed her second daughter on Christmas day three years later, she knew she’d beat some remarkable odds. Both of Hamima’s girls had December 19th due dates. Both arrived six days after their due dates. The only difference in their births is the three year difference and the time of day they were born. Maheera was born at 9:05 am on Christmas day, 2009. The newest baby, who has not been named yet, was born at 10:30 pm on Christmas day, 2012. Even the girls’ birth weights were surprisingly close. Maheera weighed in at 5lbs, 12oz and the newest baby was born at 5lbs, 11oz. Maruf Juma, 33, says that the family was busy celebrating Maheera’s third birthday at the family’s home in Coventry when Hamima’s contractions began.